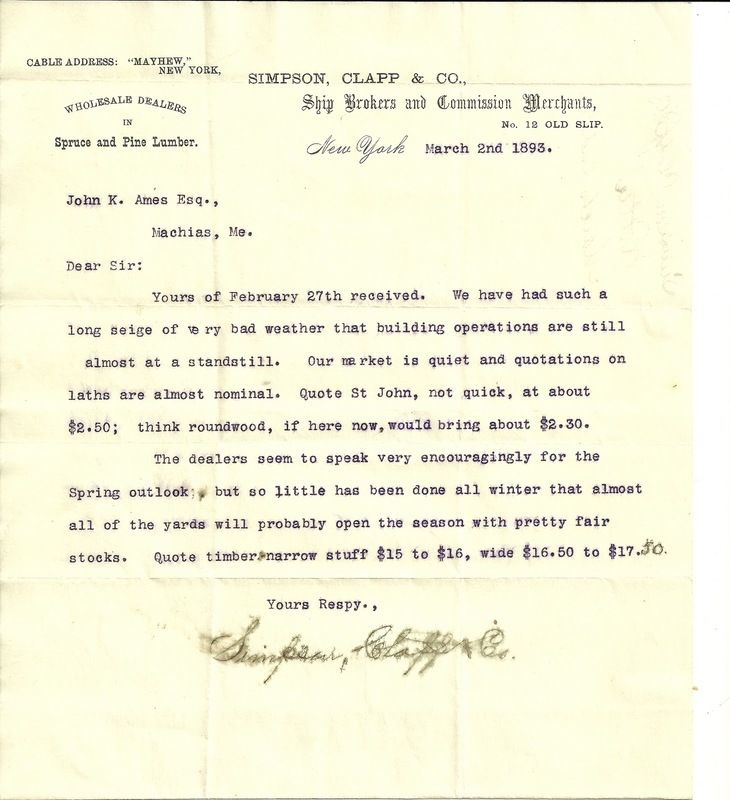 March 2, 1893 letter from Simpson, Clapp & Co, Ship Brokers and Commission Merchants, No. 12 Old Slip, New York, New York, to John K. Ames, Esquire, of Machias, Maine, painting a dim picture of the current market for laths. 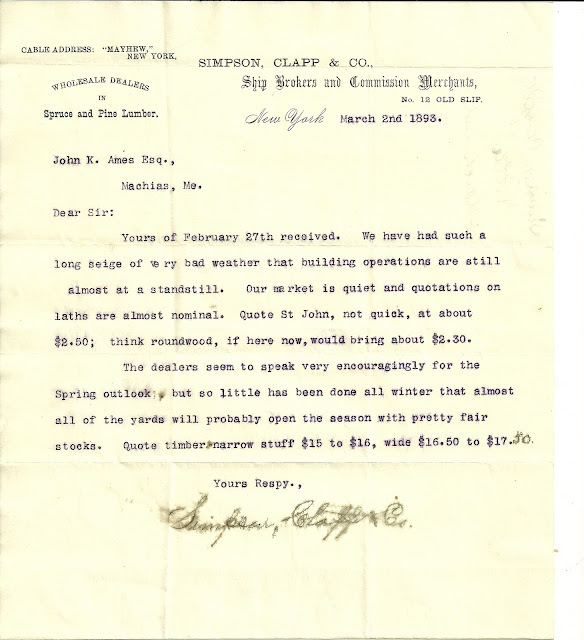 Cable Address: "Mayhew" New York Simpson, Clapp & Co.
Yours of February 2th received. We have had such a long siege of very bad weather that building operations are still almost at a standstill. Our market is quiet and quotations on laths are almost nominal. Quote St. John, not quick, at about $2.50; think roundwood, if here now, would bring about $2.30. The dealers seem to speak very encouragingly for the Spring outlook, but so little has been done all winter that almost all of the yards will probably open the season with pretty fair stocks. Quote timber - narrow stuff $15 to $16, wide $16.50 to $17.50. John Keller Ames was born 7 November 1831 in East Machias, Maine, the son of Albert and Mary Gardner (Keller) Ames. His paternal grandparents were Isaac and Abigail (Clark) Ames. His maternal grandparents were John and Susan (Phinney) Keller. Keller is a variation of the surname Kalloch, Kelloch, Kelleck, etc. John Keller Ames, as can be deduced from the letter above, was involved in the lumber industry and was a respected citizen who was president of the Machias Water Company and a state senator. He married Sarah Albee (Sanborn) Ames and they raised a family of six children. I found an interesting website dealing with the genealogy of Kalloch Family with information and photographs of people and headstones, including John Keller Ames and his family. Yes, we have him in our Ames Society archives. He is of the Anthony Eames line of Marshfield, MA. Thanks for this additional information! I notice the Ames Society was formed in Washington state. Many folks from the Machias and East Machias, Maine area settled in Washington during the mid 1800s to pursue lumbering and other interests. Port Gamble, Machias, etc.